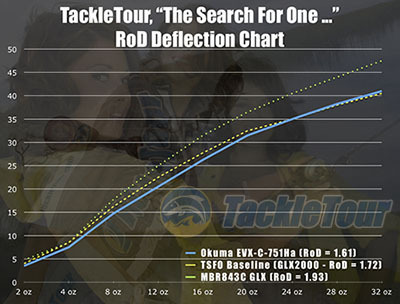 Introduction: There is an awful lot of �bling� in bass fishing these days. While much of this eye candy does its job luring in consumers, it often has little to no effect on actual fishing success. I am definitely someone who is naturally drawn to flashy objects, but with much (but not all!) of my fishing equipment I prefer to keep things stealthy and understated. For those of you that are attracted to simplistic fishing gear, the Okuma EVX series of rods delivers a very clean look at a price that won't leave a huge void in your bank account. In this review, we dissect the EVX-C-751Ha casting rod to see if its performance is just ordinary or simply extraordinary. The entire EVX series is marked at affordable prices. Quality/Construction: The overall build quality of this rod is good. The finish looks pretty clean overall, the guides and blank are straight, and the components are worthy of getting the job done. Okuma did nice work putting together a pleasing rod that has a simple appearance but avoids looking like a bargain-basement offering. The handle cork is kept to a minimum. The IM-8 blank of the EVX-C-751Ha sports a satin-black color scheme. While the majority of the surface is smooth to the touch, there were a couple portions where a hint of bumpy texture was evident. The wraps and epoxy work around the guides and logo were completed with care. Guides from ALPS adorn the blank. It was refreshing to see the quality of cork that Okuma chose for the grips. Sure, there is some filler utilized here and there, but as a whole the grips are very tight and look extremely clean. The cork actually looks much nicer than what comes on rods costing substantially more! 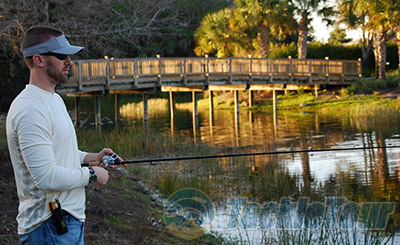 Performance: This EVX rod is a long, heavy-powered model�perfect for fishing here in Florida. It accompanied me to Lake Okeechobee as well as a few small local bodies of water. It was reserved primarily for more �macho� duties like flipping, pitching, and casting hefty baits with 20-pound line and braid ranging from 20 to 40-pound test. 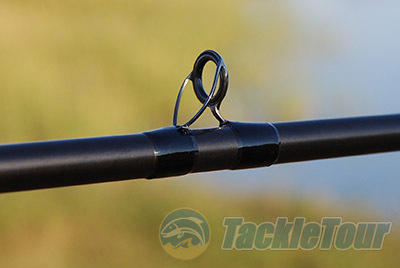 Casting: Before I even received the EVX for testing, I was expecting a very stout rod that would be best for mainly flipping and pitching duties. Despite being rated for 12�25 pound line and 3/4�1 1/4 ounce lures, I was surprised by the fact that it didn't really feel as stout as expected. While strong, this is not a soul-less broomstick of a rod by any means. 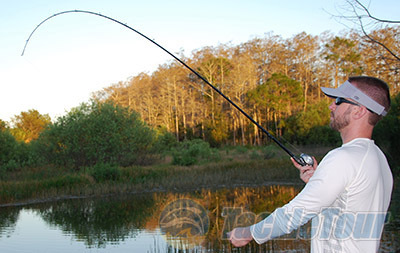 Think of it as a heavy-powered rod with some �tip� to it that makes it a satisfying caster. It handles the entire rated lure range just fine, but I most enjoyed it in the 1�1 1/4 ounce zone. This rod handles casting duties as well as modest pitching and flipping duties. Sensitivity: You can't expect NRX-like sensitivity and crispness at this price point, but the EVX offers satisfying sensitivity without feeling �dead� in my hands. The IM-8 blank communicates enough of what's going on at the end of the line to make it a worthy choice for bottom-contact applications, but it did not exceed what was expected. The rod sets up with a classic fast action. Power: Though it's not the beefiest offering around, the Okuma does sport good power and is up to the task of controlling a bragging-rights bass around cover. Just make sure to have more muscular rods on deck for more effective probing of the heaviest cover.